There is not much for me to say about today's match: it has already been said, not even an hour after the match's conclusion. We even broke Twitter, twice the whole network seized up - too many of us telling each other all about it. It was a game of two halves, and two nervous teams. Throughout the first act South Africa was afraid to attack, and the whole side seemed to play stopper. Mexico was the opposite - too quick to attack, too quick to strike, throwing away one great chance after another. Siphiwe Tshabalala's 55th minute screamer was made the instant South Africa connected as an attacking side - lightening quick and strong it caught El Tri's defense completely by surprise. Mexico's one goal was both quick and deliberate - Guardado found Márquez, who was miraculously alone. With the ball at his feet, the Barcelona center back put the ball neatly and deliberately past Khune (who had had a couple brilliant saves). The game was a great introduction for newbies to the offside rule which can confuse even experienced players and journalists, especially on corners. Apparently Martin Taylor, ESPN's play-by-play guy got it wrong when he accused the referee of making a mistake in waiving off a goal as Mexico's player was offside. Twitter went crazy, too as we all tried to figure it out. I thought the call was wrong myself until Univision put up their graphic marker for the offside line and I could see that, indeed, it was. Corners are especially confusing because the player who directly receives the corner kick (the "first touch") can be in an offside position - Vela did not receive the ball from the corner kick itself, however, but from a teammate - which is why he is required to be behind the second-to-last defender. Normally the last defender is the goalie, but it is not necessarily the goalie. Here, the goalie Khune was the second-to-last defender, and Pienaar was on the line alone. For a perfect explanation of all that stuff read Erin Bolen's breakdown for News-Leader. 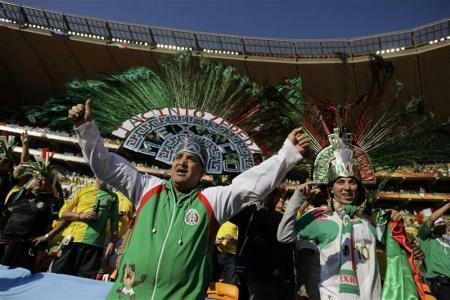 I watched the game at a Oaxacan restaurant with several hundred Mexico fans. 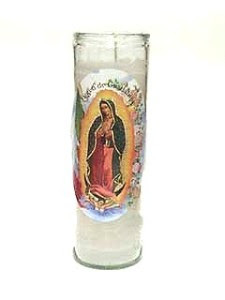 We were all feeling quite broken until one woman ran up to the front of the room with a Catholic saint candle (Virgen de Guadalupe? ), and placed it in front of the screen. Márquez scored shortly after. Olé! What a game -- nervous players, nervous spectator. I too was confused about the offside call, then had a meeting I couldn't miss, so i had to watch the tape. Avoided all kinds of public spaces on the way home so as not to hear the outcome before getting back to the DVR. Class act by both teams, lots of good mid-field action in the second. 3 minutes of stoppage nearly put me over the edge. FRA now on deck with URU. Butterflies still. It doesn't get any better than this. I remember watching the world cup as a kid with out Mexican neighbors in spanish b/c no US network carried international games. . . I am now dating myself.